Sometimes when i crochet. I just crochet as I go. Meaning, I do not intend to do anything at all. I just want to crochet. For the past weeks, I just want to come out with a desirable pattern. So I try to combine a few stitches here and there. Pulling strings out again if I dislike the outcome or just cutting off the yarn and starting again. Its a combination of chain, treble and single stitches. The good thing about combining treble and single crochet (sc) in a solid stripe is that it provides a compact look but still maintains the stretchy characteristic of crocheted materials. It is the sc that holds the treble stitches in place. 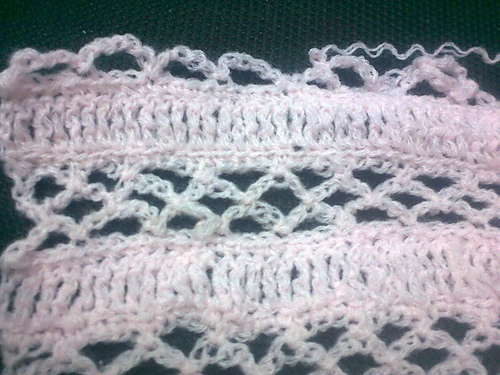 The chain stitches are there to provide the desired ‘crochet-lace’ effect. I expect this crocheted garment to have so many holes. I stitched 200 chains as a foundation. It covers the entire length of my arm. I was meaning to crochet another long-sleeved cardigan. But when I had crocheted up to the fourth stripe, i reconsidered. The vertical stripes make me look thinner. and mike said that the pattern does not look good on a sleeve. 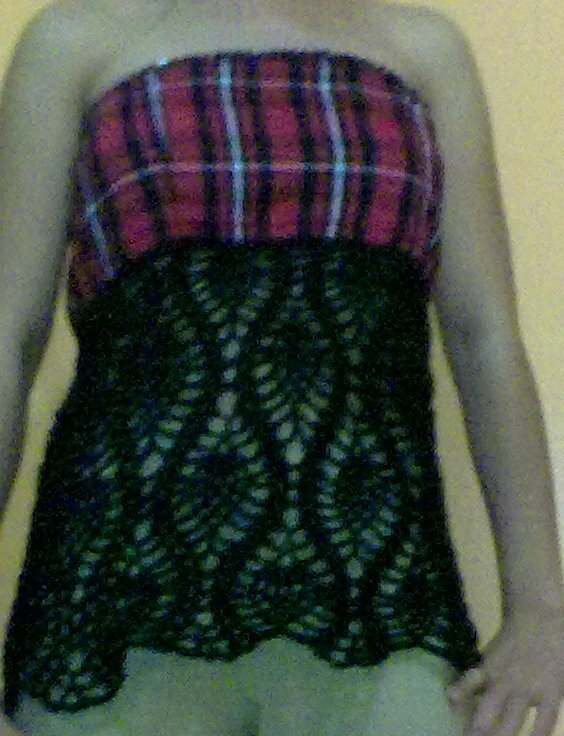 I shifted the crocheted piece 90 degrees and tried to wrap it around my body The ends did not meet. So if it’s not gonna be a long-sleeved cardigan, it should be a bolero. And with the body already completed, i went crocheting what should be the ‘sleeves’ of the bolero. 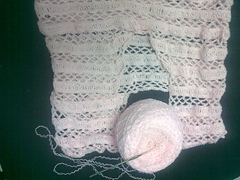 After finishing one side, i thought that i’d rather have this as a blouse. So after finishing the sleeves, i connected the two ends. And crocheted more rows on the other side of the garment. It ended up like this. And there’s a missing wide space up front. Deciding to make the neckline loose I patched the space with two right triangles. It should look okay right? As having wide neckline meant to emphasize the chest area. And theoretically it looks good on most girls wearing a tube underneath. With hopes high, i continued crocheting until the garment covered the entire length of my torso. I fitted it. And it did not look okay. Well. What’s to emphasize when there’s nothing at all? Hating it, I put the whole thing in my closet after pulling out the stitches on the neckline. This is the third project i was putting aside. And it’s not a good sign. Especially that I stopped crocheting for months. And when i decided to crochet again, nothing came out good. Next morning, saturday. I had nothing to do and the wasted top’s still in my head. I decided to get it back and reconsider. If a wide neckline is not good for me, there’s no way to go but to close the space. I have so many buttons and mylein says i look good on buttoned shirts. and so i crocheted overlapping squares on the space. But because it was a morning filled with frustrations over wasted crochet and also with empty stomach, the squares overlap too much that i could tie them together. Mylein saw it and said that it looks good enough. And maybe i could crochet the ends a bit longer to make the ribbon fall more naturally. And that’s what i did. It turned out okay and i liked it. I wore it the next day when Mike and I went out. >I have a fully loaded weekend yet I still managed to finish the promised crocheted top for mylein. Saturday afternoon: I went to Quiapo to accompany a friend. Sunday morning till afternoon: Celebration of my niece’s christening. Sunday night: Bought some groceries. It was only till 10pm when we are able to eat our dinner. Oh, the cloth was from Ilocos (it was handwoven! ), Mylein gave it to me as a pasalubong when she went there during the Christmas vacation. The yarn was from Baguio, Michael’s pasalubong when he went there during an SPP Conference last year. It’s a two ply cotton yarn. I think its blended with something else since the texture of the yarn is somewhat rough. The black beads (fake swarovski crystals) embellished on top of the blouse were bought in Quiapo (one of the few things I limited myself to buy). I first saw the pineapple stitch while browsing the multiply sites of various people.. Someone used this pattern in a toilet bowl seat cover. I saved the picture and promised myself that i’ll figure out how to work the pattern out, until i learned that this is called the pineapple stitch (Which i really do not think that the stitch created a pineapple like pattern (more of a pine-cone like pattern if you ask me)). And i found the instructions at from some helpful dude in youtube. 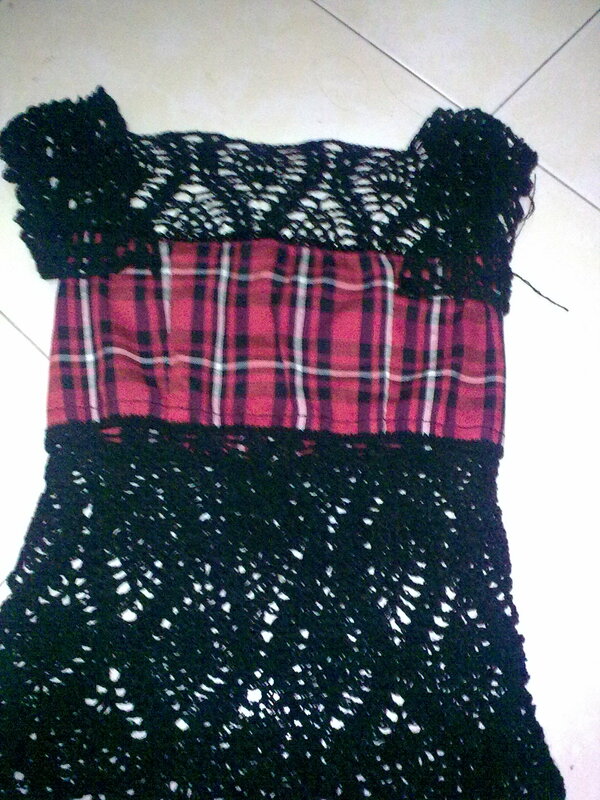 Mylein’s plans for the cloth were pleated skirts (like school uniforms) since we’ve been searching for plaid pleated skirts for a long time now… However since i do not have my sewing machine at the moment and i’m into crocheting these days, i diverted from the initial plan. It was during those times that all i have was misconception on what DC is. I have this pattern on my computer for a long time.. can’t find the decency of time to sit back and crochet so, it was only during christmas vacation that i paid much attention to it… The author of the pattern copied it from a bedsheet and made it into a skirt... 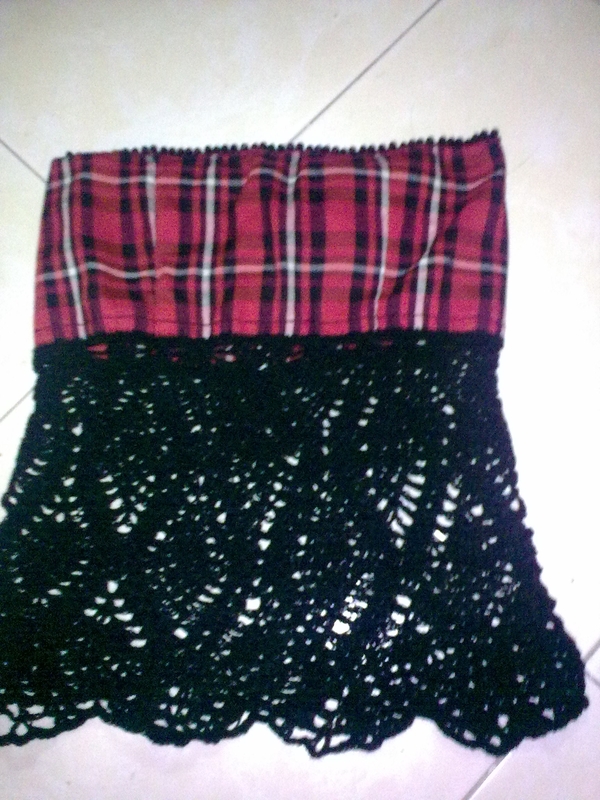 It was my intention.. to make a skirt too, just like what she did. However, work (again) took control of my time and i was enthusiastic on finishing a project then… so my hobbies were set aside come new year. It was only late feb 2008 that i remembered some unfinished crochet. 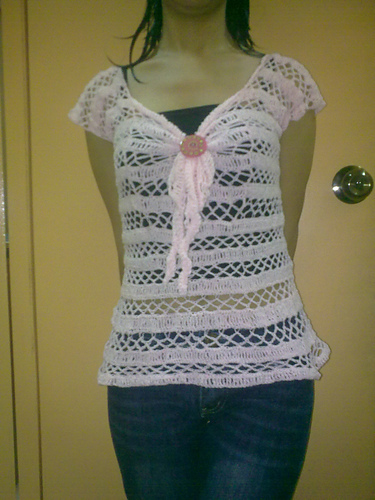 And while i’m doing it, i decided to make a blouse instead. to rachel, pardon me for not being able to follow your pattern.. I wasn’t able to understand it. I only relied on the pictures of the stitches. Thank you for such a wonderful pattern.